Looking for Savannah GA vacation rentals to book for your stay in Savannah? There are a myriad of choices just in the downtown alone, but Southern Belle can help you narrow your choices with our Savannah historic vacation rental options. 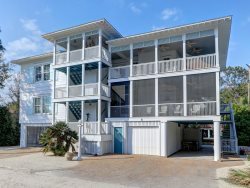 We have a huge selection of vacation rentals Savannah that can fit any type of vacation, whether for business or pleasure. We have large estate Savannah GA vacation rentals or cozy condos and town homes. Whatever style of Savannah historic vacation rental you need, you'll always get the best amenities and the best locations. One of our vacation rentals Savannah is Harris Hideaway, which is a cute and cozy carriage house in the northern Historic District. It's 650 square feet with one bedroom and one and a half bathrooms. Half bath is located in the laundry room. The property can sleep up to four guests so it makes a great choice for a solo stay or for a couple. As with all of our vacation rentals Savannah, Harris Hideaway comes with Southern Belle's great amenities. You might think if you don't stay in a hotel, you'll be missing out on some conveniences, but with Southern Belle, you'll still get wireless Internet and TVs with cable service. Many of our larger Savannah GA vacation rentals even have multiple TVs. We also provide all linens and towels, plus comfortable bedding, laundry units and full kitchens with appliances like refrigerators, microwaves, coffee makers and more. Walk into this Savannah historic vacation rental and you'll see a cozy living room with a wall mounted flat-screen TV, ceiling fan, plus a comfortable armchair and sofa. Across from this room is the full kitchen and dining area. The square dining table has seats for four so you can have guests. The kitchen is very open with room to work and all the modern appliances you need. The bedroom is right around the corner and it includes another flat-screen TV, plus a large queen bed and nightstand. Wood flooring throughout is accented with rugs and there are plenty of windows to let in light. The bathroom has tile and a huge shower stall with a ledge for sitting. Another half-bathroom area can be found in the laundry room. Using Harris Hideaway as your base, you can get started on exploring Savannah. Start by exploring the Historic District where this property is located and then you can go from there to the other popular neighborhoods in the city such as River Street, the Victorian District and City Market. In the Historic District is where you'll also find the famous Forsyth Park. The park actually borders the district, but covers about 20 acres of beautiful gardens and green landscape. You can spend time walking through the trails or pack a lunch and eat outside in the picnic areas. There's also a lunch cafe and many other restaurants nearby with views of the park. Within the park are two war monuments and the ornate cast-iron fountain modeled on one in Paris. If you're a fan of the "Midnight in the Garden of Good and Evil" book or movie, you can't miss Forsyth Park, and you'll also want to visit the Mercer-Williams House and Museum where much of the events took place. Tybee Island is another popular place to visit for Savannah guests. If you have a longer stay, it can help to get away from the bustling downtown and visit this beachfront paradise. There are still historic landmarks to visit like the Tybee Lighthouse and Fort Pulaski. You can also spend time walking the beaches, take a guided beach tour or go out on the water via watercraft rentals or one of the many charter companies. Getting around Savannah is easy. It's an extremely walkable city for one thing, and for another there are numerous tours you can take as well as the CAT Shuttle. The shuttle is free and goes through the Historic District and to River Street. Make booking your Savannah GA vacation rentals the easiest part of your trip by calling Southern Belle. We have the perfect Savannah historic vacation rental for your stay and you won't have to sacrifice amenities or a great location. Give us a call today and find out why our vacation rentals Savannah are the best in town. Everything was very well organized and explained. Your directions were excellent! Loved the property and will definitely stay again if back in Savannah! Your website is helpful and easy to book. The few times I called, your employees were extremely friendly and helpful. I called the day before our trip and spoke with Jennifer ( I think originally from Massachusetts? ), who was friendly, and very patient with all of my questions. Very very nice. We had a lovely stay at Harris Hideaway in Savannah. Was visiting in November for the Rock and Roll Half Marathon. The property is located in a lovely residential neighborhood. The unit was spotless, comfortable and had everything you could need/want. We would happily stay again. Very convenient and close to everything but far enough from the busy parts of Savannah to make it nice and quiet. We had a rental car and it was easy to find parking and it was free ( no need for visitor's permits and no meters to have to "feed"!!). We had a great time and loved the property and Savannah! !